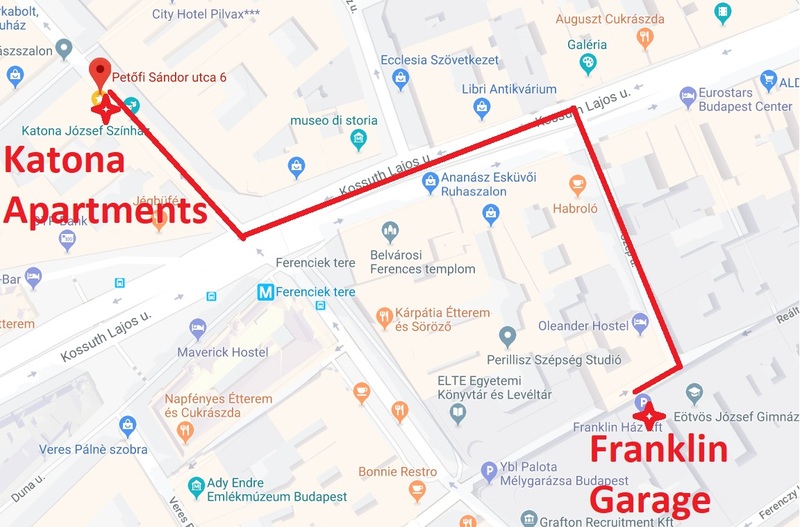 We are conveniently located in the center of Budapest. We can have a private car waiting for you at the arrivals area at the airport. The driver will have a sign with your name. There is no additional cost for this service. Please request this when you contact us. 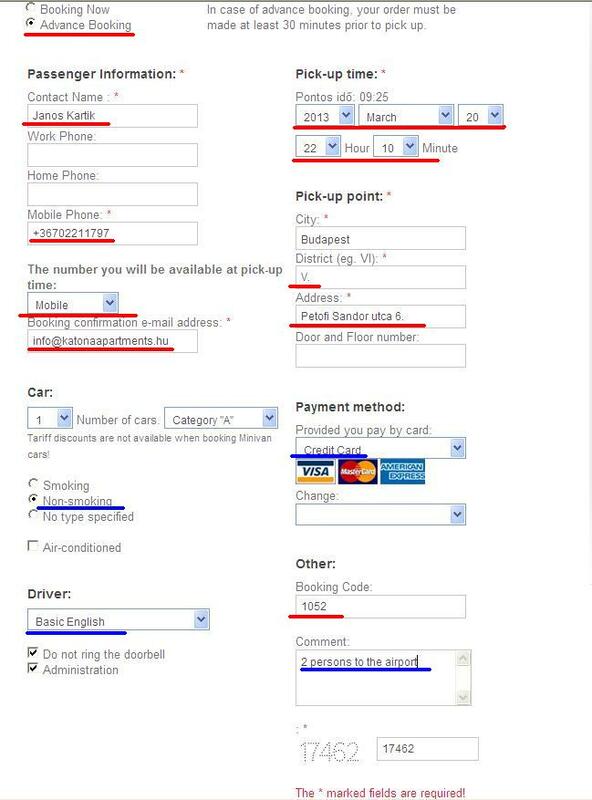 Ask for your host to order a private car for you. Liszt Ferenc Airport Terminal 1 : It is closed. Liszt Ferenc Airport Terminal 2 : It has 2 sides: "A" and "B". They are in one building, next to each other. Liszt Ferenc Airport Terminal 2 is 20 km away from Katona Apartments. This is the cheapest way to get to Katona Apartments. First, take the bus no. 200E until the terminal "Kőbánya-Kispest". This is the 9th stop (the final stop) and takes 22 minutes. There you have to change to Metro 3 (blue line). You should get off at "Ferenciek tere" metro station. This is the 9th stop and takes 15 minutes. After ascending via the escalator, go straight ahead and turn left. When you walk up the stairs, Petőfi Sándor utca (street) will be on your right hand side. You should walk on the left side of the street and look for number 6. The big "Katona" sign will help you to find the right direction. Duration: The whole trip takes about 60 minutes. This is the quickest way to get to our apartments. See Taxi section above for details. 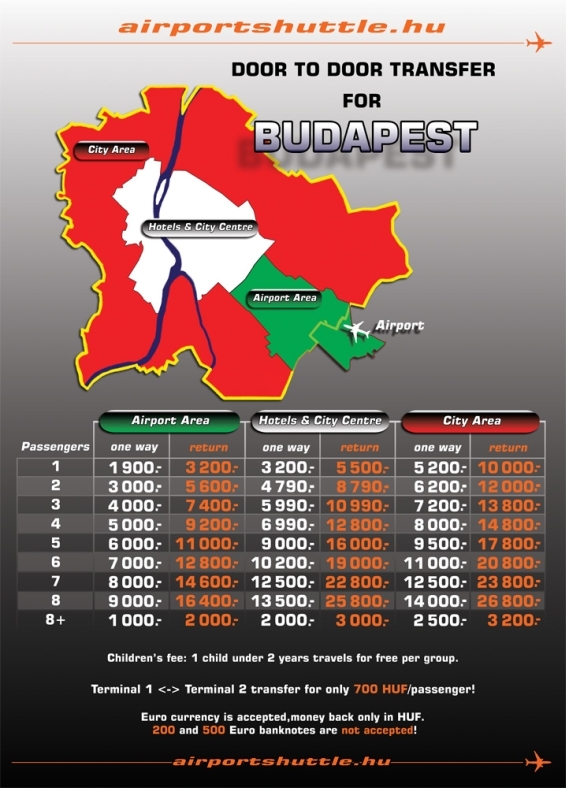 Budapest has 2 main bus stations. Take Metro 3 (blue line) towards "Újpest-Központ". You should get off at "Ferenciek tere" metro station. This is the 5th stop and takes 8 minutes. After ascending via the escalator, go straight ahead and turn left. After you walk up the stairs, Petőfi Sándor utca (street) will be on your right hand side. You should walk on the left side of the street and look for number 6. The big "Katona" sign will help you to find the right direction. Duration: The whole trip takes about 15 minutes. Take Metro 2 (red line) towards "Déli Pályaudvar". You should get off at "Deák tér" metro station. This is the 4th stop and takes 8 minutes. There you should change to Metro 3 (blue line) towards "Kőbánya-Kispest". (You have to validate your transfer ticket when switching lines or you need a new ticket.) You should get off at "Ferenciek tere" metro station. This is the 1th stop and takes 2 minutes. After ascending via the escalator, go straight ahead and turn left. After you walk up the stairs, Petőfi Sándor utca (street) will be on your right hand side. You should walk on the left side of the street and look for number 6. The big "Katona" sign will help you to find the right direction. Duration: The whole trip takes about 20 minutes. Budapest has 3 main train stations. Take Metro 2 (red line) towards "Örs Vezér tere". You should get off at "Deák tér" metro station. This is the 4th stop and takes 6 minutes. 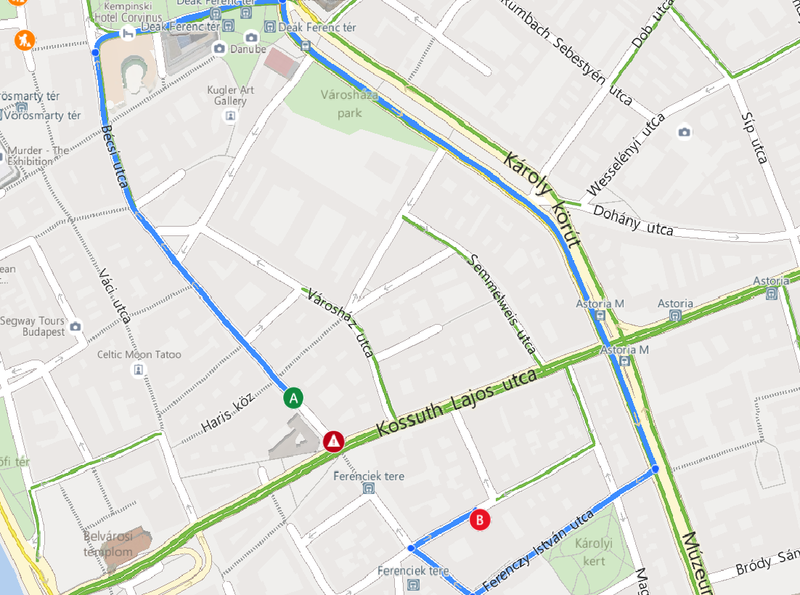 There you should change to Metro 3 (blue line) towards "Kőbánya-Kispest". (You have to validate your transfer ticket when switching lines or you need a new ticket.) You should get off at "Ferenciek tere" metro station. This is the 1th stop and takes 2 minutes. After ascending via the escalator, go straight ahead and turn left. After you walk up the stairs, Petőfi Sándor utca (street) will be on your right hand side. You should walk on the left side of the street and look for number 6. The big "Katona" sign will help you to find the right direction. Take bus number 5 or 7 or 8 or 8A or 107 or 112 or 133 or 178 or 233 or 239 towards city center. Be aware, that the buses that take you to the city center stop on your right hand side a bit forward on the other side of the square. The buses that stop right in front of the main entrance of the train station will take you in the opposite direction! You should get off at "Ferenciek tere" bus stop. It takes about 10 - 15 minutes depending on the traffic. 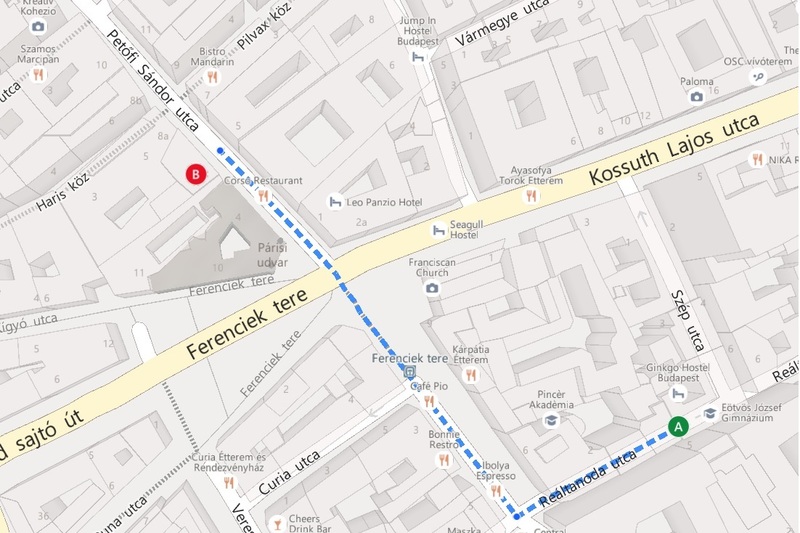 Walk back about 30 meters, Petőfi Sándor utca (street) will be on your left hand side. You should walk on the left side of the street and look for number 6. Take Metro 3 (blue line) towards "Kőbánya-Kispest". You should get off at "Ferenciek tere" metro station. This is the 3rd stop and takes 5 minutes. After ascending via the escalator, go straight ahead and then turn left. After you walk up the stairs, Petőfi Sándor utca (street) will be on your right hand side. You should walk on the left side of the street and look for number 6. The big "Katona" sign will help you to find the right direction. Parking is available either on the street or in several parking garages. Be advised that sometimes it's hard to find a free parking place near the apartments. Franklin ház garage is 2 corners away from the apartments. Most of the ships arriving in Budapest stop at Vigadó tér. Our apartments can be reached from there in less then 10 minutes on foot.